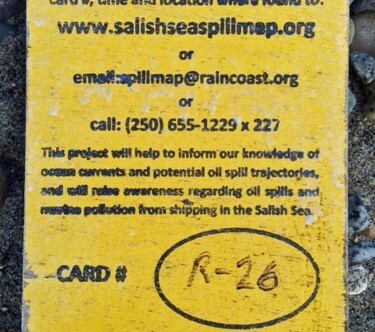 1600 wooden drift cards were dropped into the ocean at possible oil spill locations in the Salish Sea. 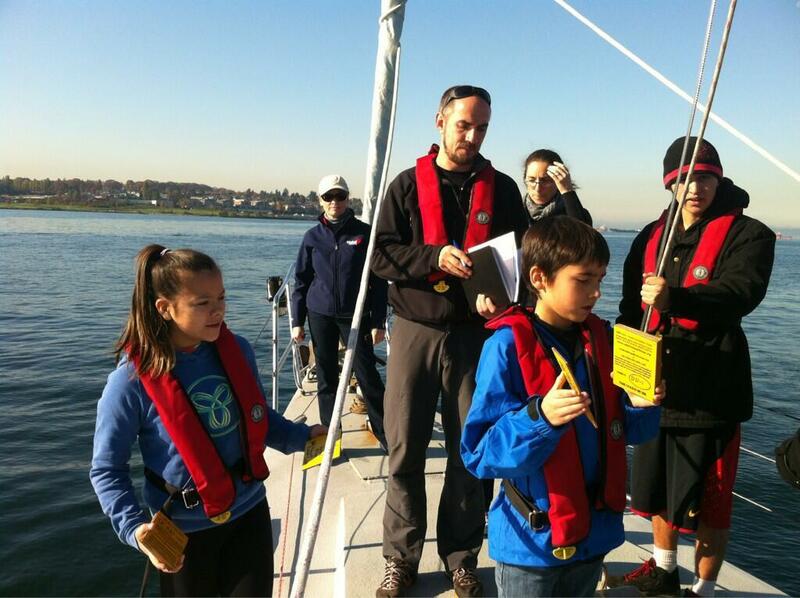 Geocology crafted a map to make reporting a drift card sighting a smooth (and accurate!) experience. 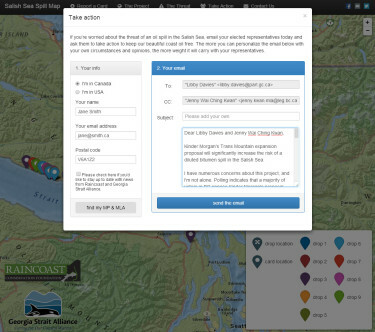 With tanker traffic possibly increasing in the Salish Sea, Raincoast Conservation Foundation and Georgia Straight Alliance decided some experimentation might be in order. 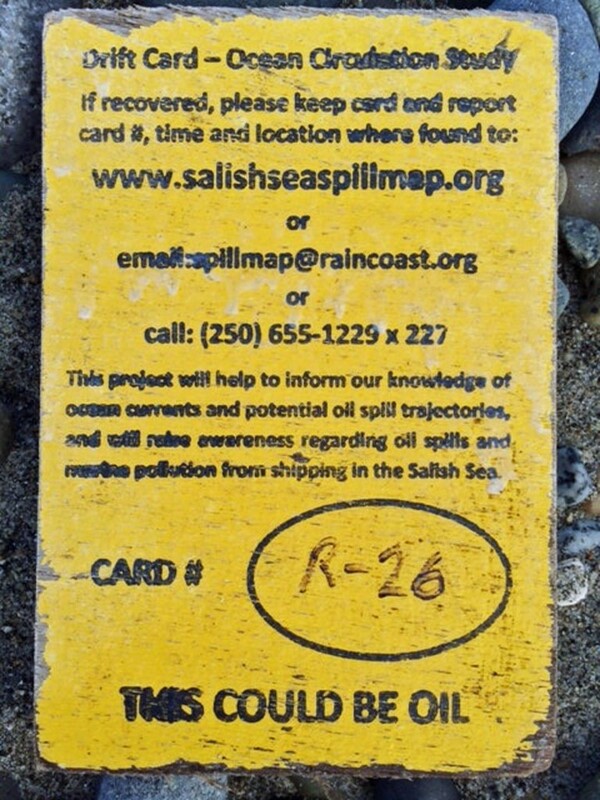 They dropped hundreds of yellow wooden drift cards into the ocean, at locations where oil spills might plausibly occur. 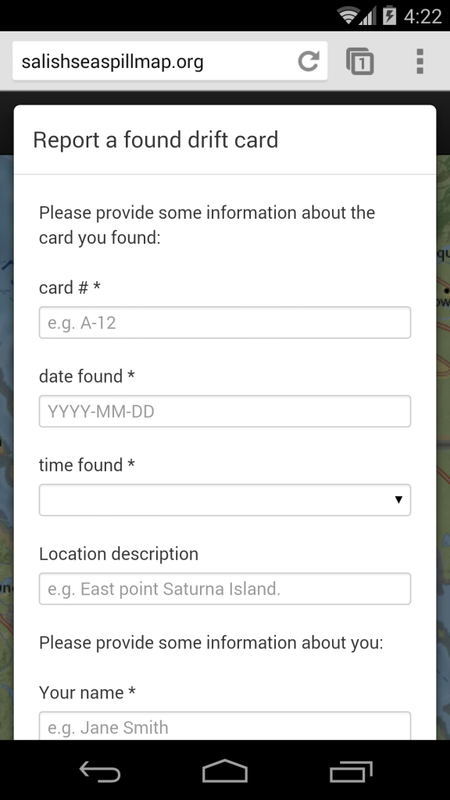 Each drift card has a URL printed on it, with a request that anyone who finds one while walking on the shoreline should go to the website and report it. 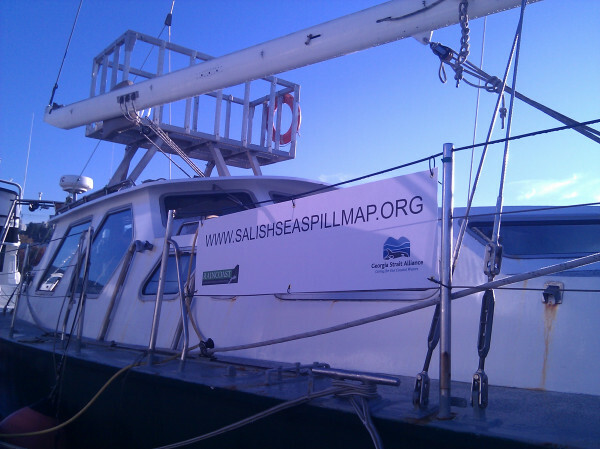 Geocology was asked to build that website. We didn’t expect many users, but we needed every single person who arrived at the site to find it highly usable. No data left behind! 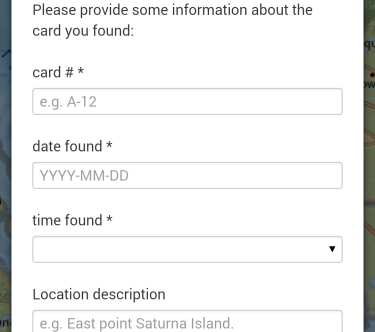 An obvious workflow guiding users painlessly and unambiguously through each step of entering their card data. Validation of that data to reduce typos and misunderstandings (this data will be used for science!). Fall-backs in case the user did get frustrated or confused. 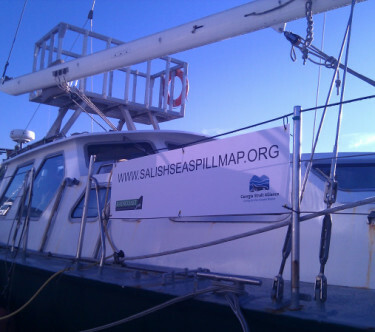 Space for additional project information to provide context and acknowledge funders. 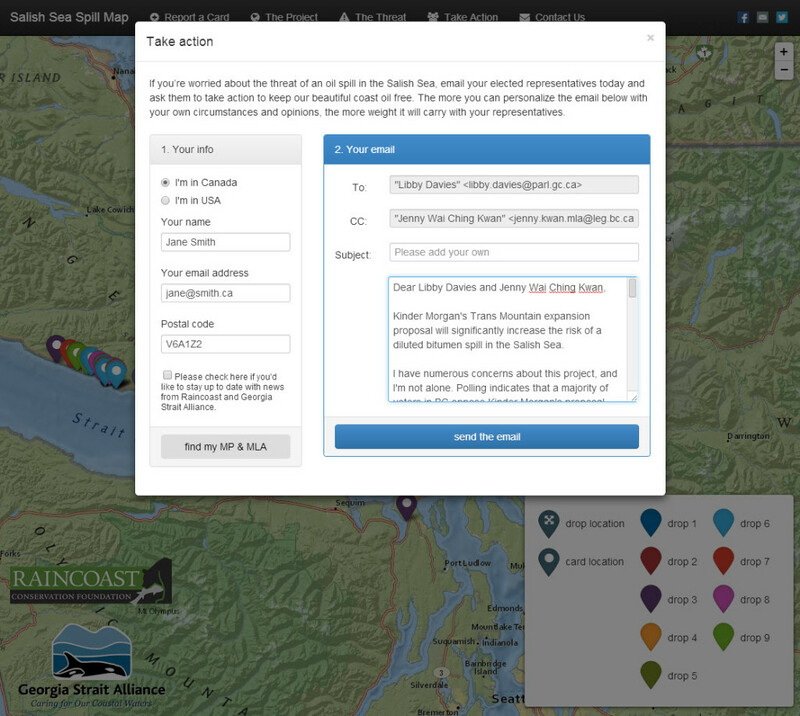 A responsive layout that worked on desktop monitors and the smart phones of shoreline strollers alike. 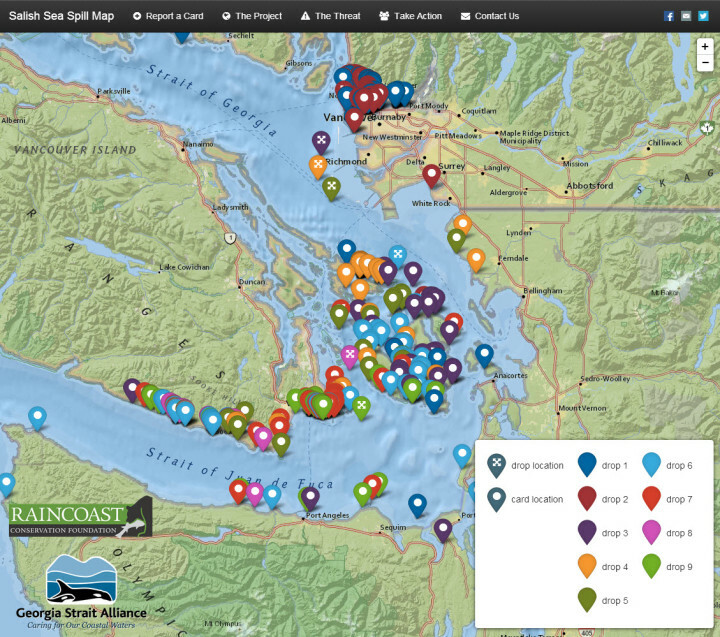 Flexible data storage to allow Raincoast and GSA staff to access, analyze and make maps of the resulting data. A tool encouraging casual visitors or finished card-reporters to send emails to their political representatives, following the same principles of ease and engagement. The map would be important, but even more important would be those forms. A lot of people spend time on the shore of the Salish Sea. 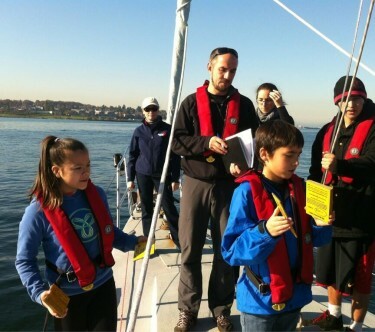 People really care about that shoreline. More drops are planned for the spring of 2014, and we will also be building maps for visualizing all of that data!